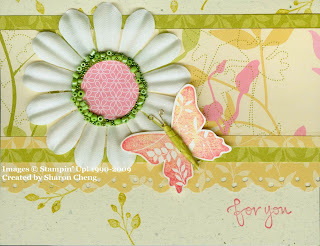 I made this card to show some of the Walk in the Park Designer Series Paper in the Occasions mini catalog. There are three different promotions to celebrate National Scrapbooking Month. 1. Buy three packs of Designer Series paper (including our Specialty Designer Series paper) or 12" x 12" textured card stock, and get a 4th one FREE! 2. Buy a sneak peek stamp set from the 2009-2010 Idea Book & Catalog--Jumble Alphabet (set of 52; double-mounted)--at a 20 percent discount. Please contact me at cheng1170@sbcglobal.net for more information about any of these specials.